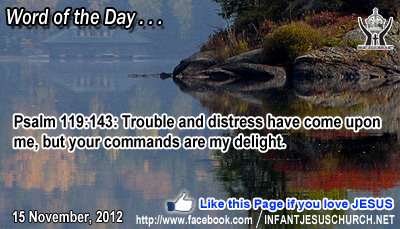 Psalm 119:143: Trouble and distress have come upon me, but your commands are my delight. Heavenly Father, thank you Lord for the new day. We ask you to bless and free your people from persecution wherever may be. Please strengthen our faith that we believe but help our unbelief. Empower us through your Holy Spirit to be obedient, forgive us when we fall. And mainly, deliver us into your glorious presence without fault. We pray this in the name of Infant Jesus, in whom we find our salvation and assurance. Amen. 20 Being asked by the Pharisees when the kingdom of God was coming, he answered them, "The kingdom of God is not coming with signs to be observed; 21 nor will they say, `Lo, here it is!' or `There!' for behold, the kingdom of God is in the midst of you." 22 And he said to the disciples, "The days are coming when you will desire to see one of the days of the Son of man, and you will not see it. 23 And they will say to you, `Lo, there!' or `Lo, here!' Do not go, do not follow them. 24 For as the lightning flashes and lights up the sky from one side to the other, so will the Son of man be in his day. 25 But first he must suffer many things and be rejected by this generation. Today’s gospel Jesus points to his second coming when he will come back to complete the work of reinstatement and final judgment. While we do not know the time of his return, we will not oversight it when it happens. It will be obvious to all, both believers and non-believers as well. When the Pharisees asked Jesus what symbol would indicate the "Day-of-the-Lord", Jesus replied that only one sign would point to that day of mine and that sign was me itself. Jesus surprised the Jews of his time by proclaiming that God's kingdom was already present among them in his very person – the Son of God sent from the Father to save the world from sin and damage. In Jesus we see the authority and the glory of God's kingdom. His divine power conquers the powers of darkness and sin. Jesus knew that the only way to conquest was through the cross. On that cross he conquered death and canceled the debt of our sins. The victory of his cross opens the approach for us to become citizens of God's kingdom. Do we seek the coming of God's kingdom with blissful hope? Loving Infant Jesus, may your kingdom come and may your will be done on earth as it is in heaven. Be the sovereign of our heart and the Master of our life that we may always live in the freedom of your love and truth.